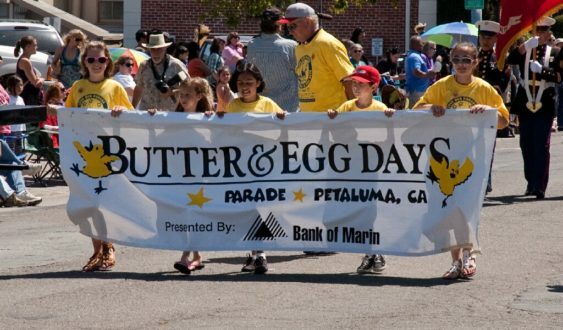 The Butter & Egg Days Parade & Festival celebrates Petaluma’s rich agricultural history as one of the premier dairy regions in the country. This year’s theme “It’s Always Punny in Petaluma. Celebrating all that is udder-ly egg-ceptional in Sonoma County and Clo the Cow’s 50th Birthday. Cow chips and donkey apples will take flight at 10 am in front of McNear’s. The always popular “Cutest Chick Contest” begins at 10:15 am on the Petaluma Egg Farm stage on Kentucky Street outside of Copperfield’s Books. The 100-unit parade features over 3,000 participants, more than a hundred volunteers and supports every aspect of community life. The event typically draws over 25,000 attendees. Activities before, during and after the parade include four blocks of exhibit space for arts and crafts exhibitors, food vendors offering a wide variety of festival foods, sponsor booths, community and non-profit booths and a large area to entertain youngsters with inflatables, rides, and hands-on activities. The Butter & Egg Days festivities continue on Sunday, April 28th when the historic downtown district transforms into an open air marketplace for the Spring Antique Faire. Treasure hunt among over 200 vendors from 8 am to 4 pm. Did you Know? Together with The Petaluma River, eggs and dairy products created an economy that turned Petaluma into one of the most prosperous communities in the state in the early 1900s.